We are proud to now be a dealer for A Quilter’s Eye (AQE). This is an important tool for long arm quilters. A Quilter’s Eye is mounted on your long arm machine and provides a real time view of the bottom of your quilt as you quilt it. You can quickly see if your thread tension is correct. No more getting on your knees crawling under your quilt frame with a flashlight to see how the back of your quilt is quilting. Also avoid the dreaded picking out stitches because you were not able to catch the tension problems in a timely manner. A Quilter’s Eye is easily mounted on any long arm machine in just minutes. It consists of a small camera with a magnifying lens and built in lights. This mounts on the side of the bottom arm of your long arm machine. 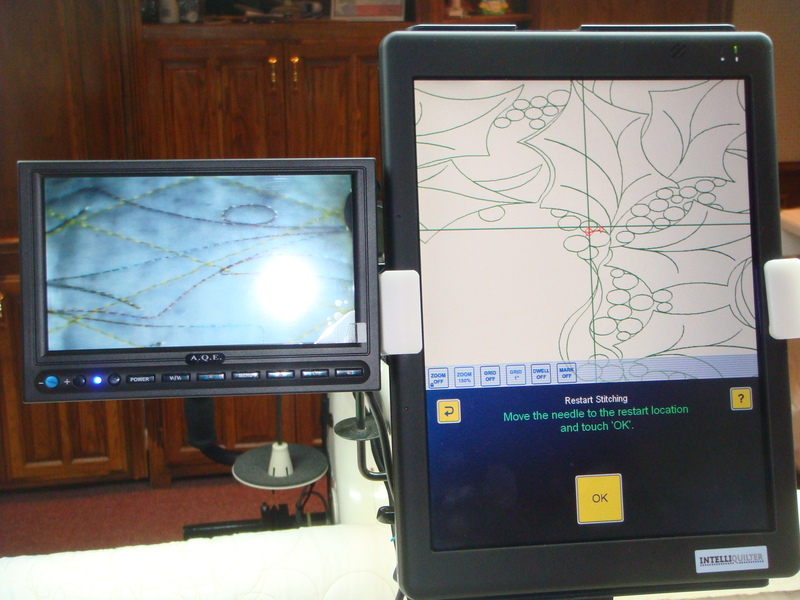 There is a 7” color LCD monitor mounted on your quilting machine head so as you quilt, you can easily see the top of your quilt and the bottom of your quilt. The addition of A Quilter’s Eye to your machine saves your knees, does away with the flashlights and mirrors and saves you picking out stitches. An added bonus with A Quilter’s Eye is that you can use the camera to aid in timing your machine. The camera can be used to easily see the relationship of your needle and the rotrary hook assembly. To see the ease of installation and manual click here. We are quilters and we are users and believers of the AQE system. We provide service after the sale. If you have any questions or issues, please let us know so we can resolve any concerns you may have. To see what is involved for installation with the IntelliQuilter System, click here. To order your AQE system today, click here.